Rooftop gardens and community access to wetlands next to the development are two of the features of a new apartment project planned in Minnetonka by Minneapolis-based CPM Development. The 93-unit market rate apartment project is slated for an area near the southwest corner of the intersection of Highway 169 and Minnetonka Boulevard (County Road 5). The four-story project, called Tonka on the Creek, backs up to Minnehaha Creek. The project will have balconies for each unit that are each 60 square feet. It also will have a large rooftop common area that includes a fire pit, grill station, and raised garden beds for residents, according to a summary provided by Harris Architects, who submitted the project information to the city on behalf of the developer. Harris describes the building’s design as being “contemporary organic” with stone, brick, cement fiber siding and metal composite panels. The rear of the building strives to “disappear” and blend in with the surroundings. This is the first suburban project for CPM Development, according to DanielOberpriller, company principal. The firm has a half-dozen student housing projects near the University of Minnesota that are either under construction or in planning phases. Clark Gassen, a Minneapolis-based developer, is assisting CPM with city approvals, Oberpriller said. 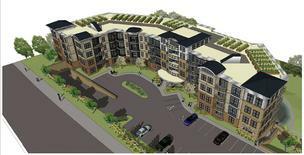 The city is tentatively planning a public hearing for this project at its May 23 meeting of the Planning Commission.